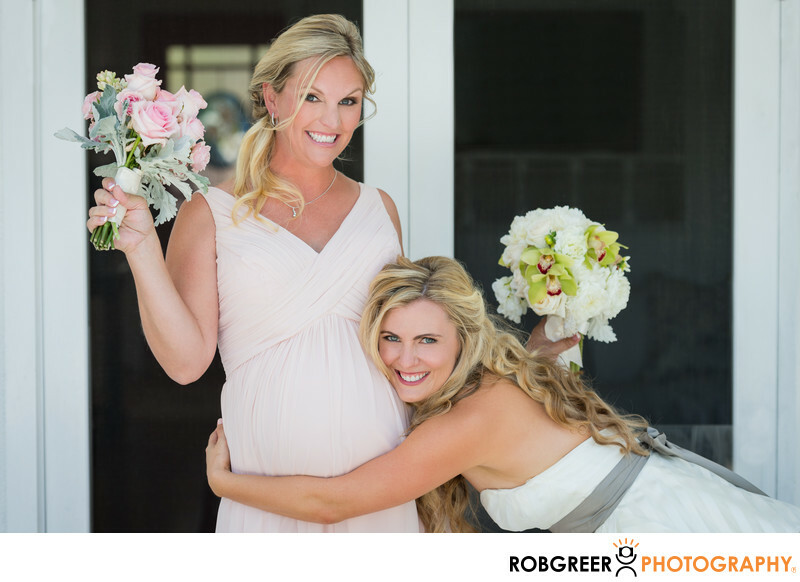 For this Malibu wedding, the bride's maid of honor and best friend was expecting her first child. The bride shared with me before the event that the maid of honor was concerned about how she would appear in photographs and that I should avoid photographing her in ways that would show that she was pregnant as she might the uncomfortable. When I met her in person, and realized how beautiful she looked as a soon-to-be mom, I was blown away and put that advice on the back burner. After I took a traditional portrait of the bride and her best friend, I tried to think of a cool way to embrace her pregnancy and I came up with this idea. The maid of honor has since had her daughter, but I'm certain that this photograph will remain precious to them both forever. Whenever I take portraits on a wedding day I'm always looking for ways to show the personalities of my subjects. I hope that I've done so here, and I will continue to look for moments they can be transformed into something truly spectacular. This wedding was photographed at a private estate in Malibu, California. 1/800; f/5.0; ISO 400; 102.0 mm.